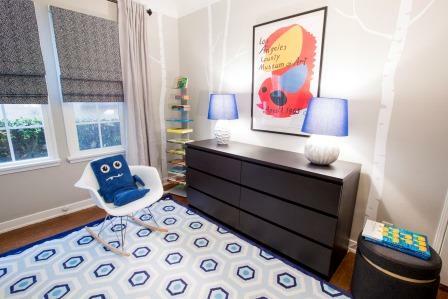 This kid’s room makeover made one little boy a happy camper. 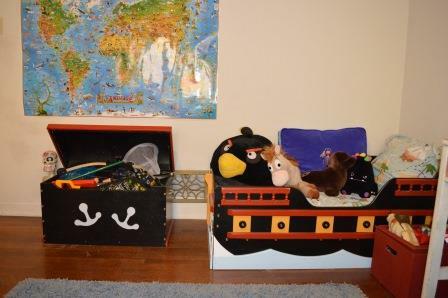 Six-year-old Stephen shared his room with a queen-size guest bed, alongside his pirate-ship toddler bed, which he had outgrown. The rest of the room was furnished with mismatched hand-me-down pieces, and everywhere were piles of clothes and toys, with no place to put them. 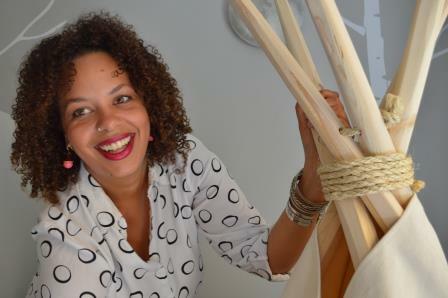 Enter Los Angeles interior designer Baiyina Hughley. After accessing the space and chatting with Stephen about his favorite activities and toys, her vision of a camping theme emerged. "I wanted to create a space that was playful yet organized, and I knew right away that I wanted an overall design direction that Stephen could grow with over the years” said Hughley. 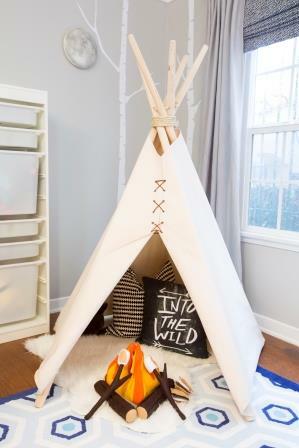 In keeping with the camping theme, Hughley was excited to make a focal point of the room a five-foot high mini teepee from House Inhabit (Etsy, $130), one of her favorite elements of the room which she felt would encourage play and discovery. 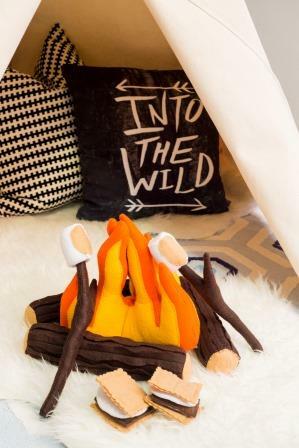 To complement the teepee, Hughley added a Felt Campfire Playset with S’Mores. Inside, she made it cozy with an Ikea Stockholm Cushion ($14.99) in black and white and a Tejn Faux Sheepskin rug. 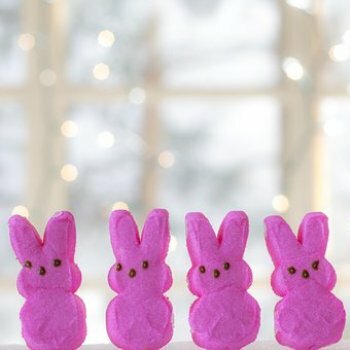 "These types of whimsical details are what add charm and personality to a space, and Etsy is one of my go-to resources, especially when it comes to kid spaces,” said Hughley. Above the tee pee she placed a Moon in My Room (Toys R Us, $20.99) remote control nightlight to create additional height and visually balance the vignette. 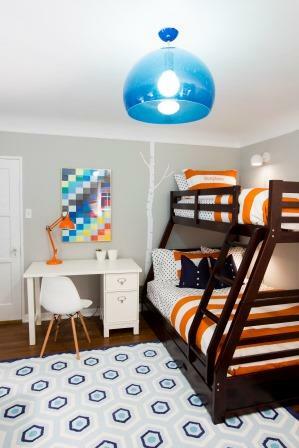 Hughley felt that a wall graphic would make the ceilings appear higher, and she wanted to explore using a fresh modern color scheme outside of the typical navy blue and forest green so often seen in boys' bedrooms. She chose made-to-order removable white vinyl birch tree decals from Décor Your Wall (Etsy, $115) against a backdrop of light gray (Sherwin-Williams, Harmony Light French Gray 0055, flat enamel, matte). Hughley chose a bright white for the ceiling (Sherwin-Williams, Harmony Extra White 7006, egg-shel), and to separate the walls from the ceiling she placed a decorative wood trim border just under the curve of the cove ceiling. This detail adding a charm to the room that felt right in line with the original architecture. All trim and the door were also painted bright white (Sherwin-Williams, Harmony Extra White 7006, semi-gloss). Since Stephen likes to host sleepovers, bunk beds were a practical and space-saving choice. Overstock.com carried a perfect storage solution of bunk beds with two roomy drawers (Junior Roommates Twin-Over-Full Bunk Bed with Two Drawers, $1,345.99), and mattresses for the beds (Beautyrest Elements Plush Pocketed Coil, twin $239.99, full $284.99), which arrived compressed and rolled in a box. After taking the mattresses out of the vacuum sealed bags, they unfurled and plumped up to become amazingly comfortable beds. The bedding added flair to the room with the opted for a bright orange and white Rugby Stripe Duvet Cover ($69 twin, $99 full) from Pottery Barn Kids with a matching sham ($24.50) personalized with Stephen’s monogrammed initials, and Pottery Barn Teen Reverse Dottie sheet set (sale priced $22.99-$38.99). Underneath the covers were down alternative inserts ($29.99 each) for the duvet and gusseted pillows,( two pack for $29.99) from BrylaneHome.com. Accent pillowed included two navy Lacoste pillows ($25 each) from HomeGoods. One of the biggest challenges in designing the space was the fact that there was very little direct sunlight in the room throughout the day. There was also very little task or ambient lighting. Hughley solved this with plenty of lighting options. She chose the FLY Suspension Pendant light by Kartell ($350) in petrol blue, which she liked for its fun modern color and its large size. “The biggest mistake you can make is choosing a light fixture is choosing one that's too small,” said Hughley. Other lighting additions included two blue-and-white accent lamps (HomeGoods, $25 each), a bright orange metal desk lamp (Euro Style Lalla Desk Lamp,Overstock, $66) and two white plug-in wall sconces (Eyeball Sconce, Urban Outfitters, $29 each) placed so that each bunk had its own personal reading light. 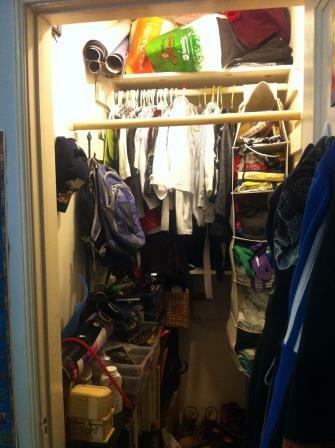 Another of the functional challenges of the room was the small closet. The walls were in bad condition, and some of the shelving in the back was not accessible. Hughley wanted to add function to the closet while also bringing in a sense of playfulness and whimsy. 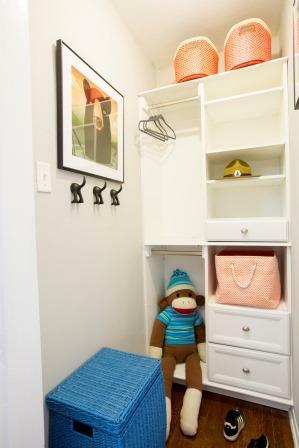 With the help of a consultant at WoodTrac, Hughley assembled the ideal closet with cabinets, drawers and cubby spaces suited for clothes, shoes, hats, and the odds and ends Stephen collected. 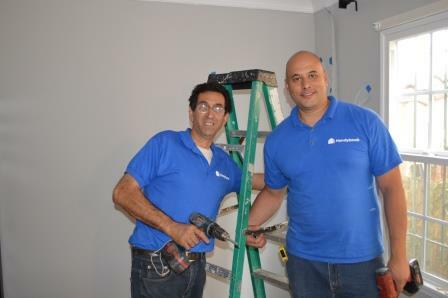 The installation of the closet took about a half-day with the expert skills of two Handybook handymen. 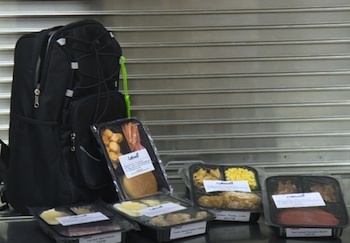 For assembly jobs like this as well as furniture assembly, electrical installations and other odd jobs, Handybook proved a reliable go-to resource throughout the redesign project. The transformation was remarkable as the jumbled storage space became an orderly and even inviting space, complete with custom-framed wildlife artwork from postercheckout.com and dog-tail clothing hooks (IKEA, $2.99 each). Toys, electronics and other knick knacks now had a home in drawers, cubbies and tidy wicker storage bins (HomeGoods, $20). “I was nervous to order a rug online, but I was blown away by the quality when we received it,” said Hughley. For other furnishings, Hughley chose the Pottery Barn Kids sturdy white Schoolhouse Basic Desk ($589) with brushed nickel hardware, which offered a large surface for homework and art projects along with two big drawers for supplies and files. The desk was also useful as a nightstand for the bottom bunk. Hughley paired the desk with a molded plastic side chair (InStyleModern, $99) and placed a similar armchair rocker across the room (InStyleModern, $135) as a reading chair. Hughley chose IKEA’s MALM 6-drawer dresser ($149) in a dark black-brown finish because of its clean lines, ample storage and the masculine color that related to the finish on the bunk bed. At the foot of the bunk bed, Hughley placed the IKEA TROFAST ($39.99) and plastic bins ($3-5) for additional toy storage. For books, Hughley chose the array silver bookcase from CB2 ($189), a steel vertical rack to hold Stephen’s favorite reading material. To decorate the walls Hughley hung above the dresser a large-scale framed Calder museum art poster that fit right into the room’s color scheme. She custom-created another kid-friendly framed poster for above the desk using Pantone paint chips which allowed her to have creative control of the colors and patterns. 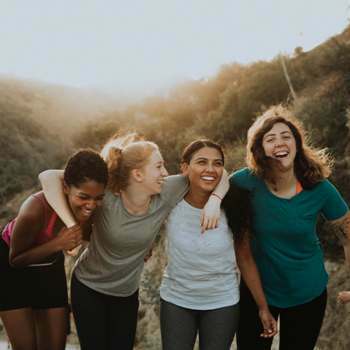 While there are plenty of exciting elements in the room -- a bunk bed, a teepee, a bonfire -- the first thing Stephen complimented upon seeing the completed space was the window treatments. Hughley selected gun-metal black drapery rods with square finials (HomeGoods, $19.99) the IKEA AINA grey linen curtains ($49.99 pair), similar to the paint color, to visually widen the span of the windows while not competing with the rug or bedding. Hughley was successfully able to mix prints by varying the scale around the room. 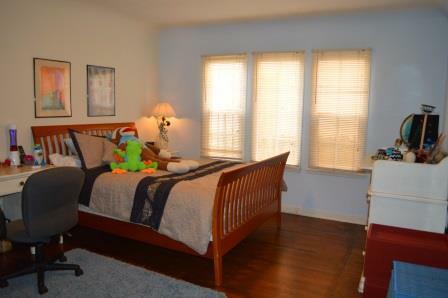 Her choice of orange for the bedding brought brightness and warmth that countered the coolness of the grey and blue. Her other accomplishment was in making the space completely functional through the layout and placement of furnishings, which created distinctive zones within the room. “I hope that I've created a space for Stephen to grow with over the years. It was very empowering to create a foundation and direction where he still felt open to making it his own,” said Hughley. 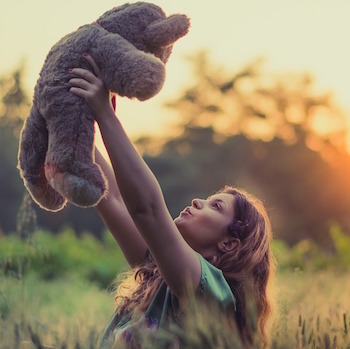 “One of the biggest successes of the project was making the process of letting go of old toys and clothes a positive one. He was making space for something new!